"REF32PIC" ALL BEVELED LEADED GLASS ENTRY CUSTOM AT GLASS BY DESIGN. Leaded glass window in this 8 ft mahogany door was all beveled. 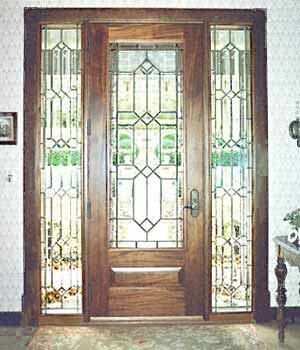 The sidelights next to the door are also all beveled leaded glass. This is clear beveled glass with no color. The camera sees everything through the clear textured glass.